Dragon Fruit. How to Plant the Extraordinary Fruit. 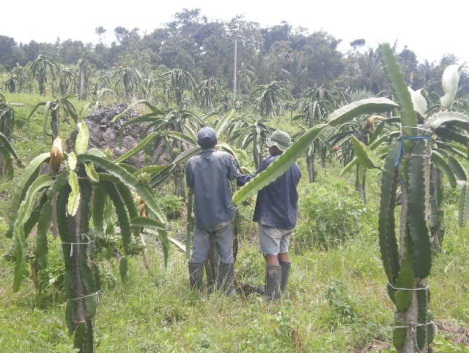 Dragon fruit market demand is increasing, but it is not followed by an increase in production. Dragon fruit production in the area of Sumedang, namely Hamlet Golempang, Cibeureum Wetan village, District Cimalaka, Sumedang regency, West Java province have not been able to meet the target. One of the obstacles faced in increased production of dragon fruit is the ability to form the fruit is naturally low (poor fruit set), a lot of flowers autumn or fall before it becomes a fruit. Therefore, in the pollination needed human help, namely through artificial crosses (Kris, 2003). Crosses are the most popular way to increase genetic variation, because it is cheap, effective, and relatively easy to do. Crosses dragon fruit is still rare, so we need research to know is there any difference between the results of dragon fruit plants from crosses with not the result of a cross. Research crossing is expected to increase the yield of white dragon fruit species (Welsh, 1991). One type of dragon fruit plants are often grown commercially is a kind of red dragon fruit (Hylocereus polyrhizus). This red dragon fruit many types of consumer demand due to its attractiveness and health benefits. However, the existing production is not optimal so it can not meet the targets to be achieved. Constraints faced in increasing the production of dragon fruit is the ability to form fruit on the red dragon fruit species is naturally low (poor fruit set). We make a research such this treatment on Dragon Fruit the Plant the Extraordinary Fruit: a cross between flowers (crossing), a cross between the varieties (crossing) and pollinate naturally used as a comparison (control). Result of the research will enhance the value of dragon fruit both quality and quantity point of views. The result of this reasearch is presented on other blog. thanks.